Given that plans for Crossrail II are still undecided, the only big project with any indication of definitely going ahead is the Bank Station Capacity Upgrade. This may not sound that big a deal, and new railway lines generate far more excitement but it, is important not to underestimate the significance of the Bank Upgrade Project. One of the many entrances to Bank station. Actually, if you look very carefully you can see a second unmarked arched entrance in the background. A major station upgrade that doesn’t involve a new line serving it or a major enhancement to an existing line is a rare event. Victoria is a rare exception, and anyone who doubts the size of this only has to walk around the station to see the significant construction work taking place over a wide area to appreciate the project’s size. King’s Cross Underground upgrade may not have involved a new Underground line, but it was considered vital to support the new international terminal at St Pancras next door. 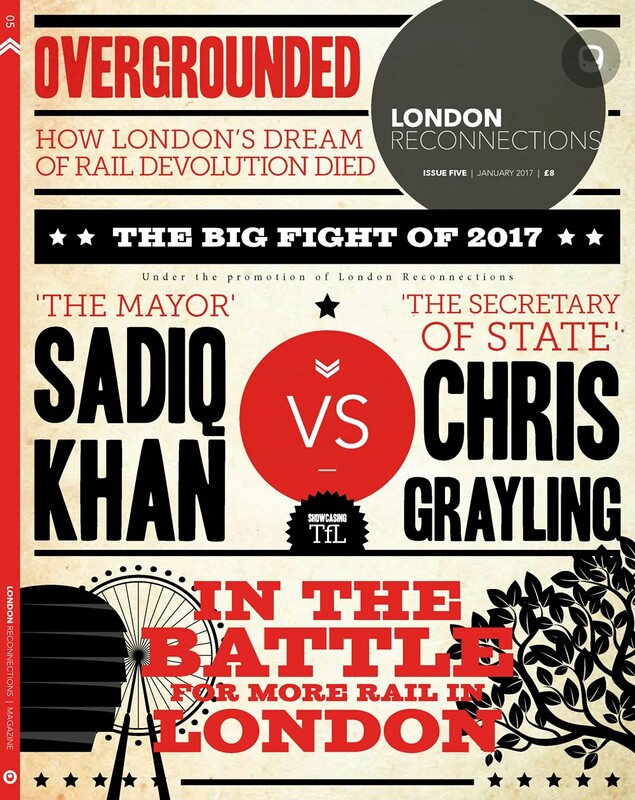 London Underground will tell you that the expansion of Tottenham Court Road (TCR) is really two separate schemes next to each other – Crossrail and an Underground upgrade – but that is not how it is presented to the public. Indeed to find a truly comparable scheme to Bank one probably has to go back to the 1920’s and the reconstruction of Piccadilly Circus station. Regardless of the current status of banks and the financial sector in general, it is still true that they are a vital part of our economy. For them to function properly there must be good public transport in the Square Mile, with gives Bank station a level of importance perhaps greater than one might think. Yes, Victoria and King’s Cross St Pancras are important too but their importance comes from their status as transport hubs, rather than their locality. Bank is important because the immediate surrounding area is arguably crucial to the wealth of the country. The Square Mile has major railway termini on its periphery but it relies on people walking, buses, taxis, the DLR and the underground for getting the workers to the heart of the city. Of these modes of transport arguably the most important for shifting lots of people is the Underground. Now consider the relatively large area bound by London Wall to the north, the Thames in the south, St Paul’s in the west and Tower Hill in the east. Only four Underground stations lie within this area. Take into account that three of them – Mansion House, Cannon Street and Monument – are on the same line and quite close to each other. Hopefully this starts to indicate precisely why Bank has become the major Underground station serving the city. 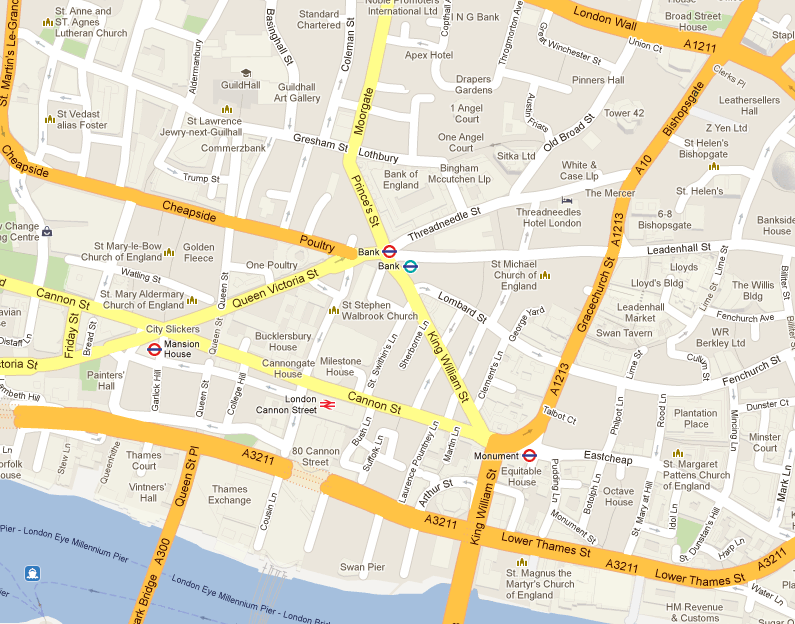 The four Underground stations (Cannon Street Underground station is not separately marked). Although there are others just outside the area, for an important part of central London this is surprisingly few. If further argument were necessary, it is pertinent to point out that Bank and Monument are really just different parts of one station and it is possible to access any platform at Bank from any platform at Monument and vice versa without going up to street level – although the walk at street level is often quicker and is a valid Out of Station Interchange (OSI). Indeed it has been said that the only reason they are advertised as separate stations is so as not to confuse the Fire Brigade. However this isn’t the end of the matter. 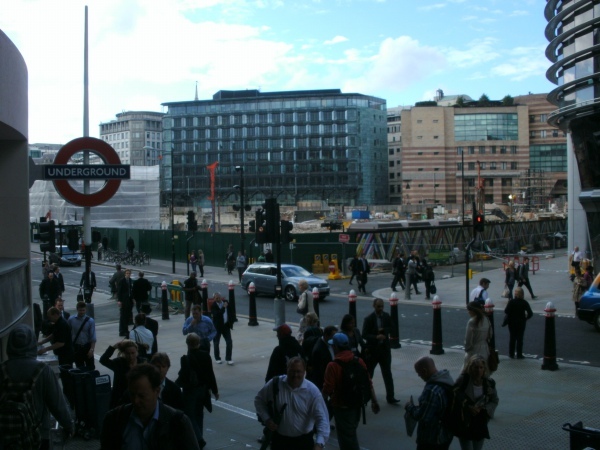 To support their case for the proposed station upgrade, London Underground claim that Bank station is the system’s fourth busiest interchange station. They quote a figure of 96,000 passengers (entering, exiting or changing lines) in the morning peak period which appears to be based on approximately 8,000 entering, 48,000 exiting and 40,000 changing from one line to another. It is presumed that these figures include DLR passengers. If all goes according to plan the Northern line should be resignalled by the end of 2014. Assuming that there are enough available trains then the intention is to run 30 trains per hour down the City branch of the Northern line during peak hours. Optimistically this means a bit of relief and less-crowded journeys. In recent years, however, many major cities have noticed that schemes intending to provide relief very quickly result in exactly the same level of crowdedness. In other words, like the motorway building of the sixties, all you do is either provide a journey-opportunity for the existing latent demand (basically people who would have used the service but found it too crowded or physically could not get on the train) or create the desire to make a journey where none existed before (such as someone who didn’t consider applying for jobs in the City because the journey was so horrendous). This means that by 2020, despite both Crossrail and Thameslink, the problem will probably actually worse than today. London Underground have thus been acutely aware of the need to develop a scheme for an increase in capacity for Bank station for some time. Without it, it is predicted that Bank station would have to be closed at certain times of the day, just as Victoria Underground Station does today. Unlike Victoria though, closures would be more likely to take place in the evening and it is no surprise that a lot of people are more tolerant of being late for work with a good excuse, than being late getting home. For employers any delay is going to result in a less content and less productive workforce whether caused directly by a late arrival or indirectly by additional stress or employees being more tired at work due to a longer commute. One suspects that employers in the square mile are amongst those with the greatest power to lobby and influence others so doing nothing really isn’t an option. It is quite remarkable to think that even in 1900 all the Underground lines that serve the current Bank/Monument station were in place. The south part of the District and Circle lines was completed in 1884, the Waterloo and City line had already reached “City” in 1898 and only two years later there were stations on what are now the Central and Northern lines at Bank. Even more remarkably, the Northern line platforms replaced an even earlier station at King William Street that was only open for ten years. There is no really satisfactory route connecting the Central line platforms with the District and Circle line platforms. It could be argued that this is not necessary as there is no real logical reason to do this – especially as there is an interchange at Liverpool Street. However the Circle line is not the most reliable or frequent of lines so some people prefer a subterranean journey that avoids a change of train – especially when it is raining. Even if all the through pedestrian traffic was eliminated from the Northern line platforms they will regularly become dangerously crowded – if they are not already. Visitors to Paris who use their metro will be used to entering one station and mysteriously finding themselves at another without having caught a train in the meantime, but for London, at present, the case of Bank and Monument is unique. Of course once Crossrail opens this will no longer be the case. There have been enhancements since the escalator connection was built. Some major reconstruction was necessary due to a direct hit by a bomb in 1941. The only major subsequent enhancement, however, has been the arrival of the DLR located below and parallel to the Northern line platforms in 1991. Like the Northern line this linked up with both Central line at Bank and the District and Circle lines at Monument. To provide a shorter route to the Waterloo & City line an additional passageway was also constructed but the whole scheme really was a case of “tacking on” to what was currently there rather than a holistic approach to the whole station complex. This was probably due to London Underground being extremely strapped for cash at the time, and putting the burden of these costs onto the DLR as it was would have almost certainly resulted in the cancellation of the DLR extension to Bank itself. There is one enhancement at Bank that we will see before 2018, and and is indeed due for completion around 2015. To be precise December 2015 (“Milestones” set by TfL for major projects always seem to involve a completion milestone in December). This enhancement is a new entrance that will link to the eastern end of the Waterloo & City lines from Walbrook Square as a part of a major property development. As is not unusual these days, the new underground entrance will be paid for and constructed by the developer and this was a requirement of planning permission being granted. The connection will be via an escalator but it will only be to the Bank end of the Waterloo & City line platform which is not ideal for accessing the rest of the station. Indeed one suspects that the entrance may only be open during the hours of operation of the Waterloo & City line, which are substantially less than any other line and see no services at all on Sundays. One also imagines that the new entrance will have disabled access (i.e. a lift) but this will be of limited us as there is no corresponding facility at Waterloo. 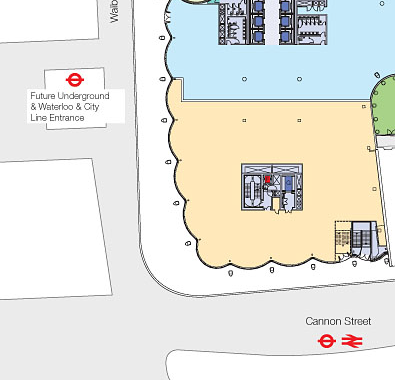 A developer’s map showing the new “Walbrook Square” complete with Underground entrance. What is particularly remarkable about this scheme is that the new entrance will only be a very short distance from Cannon Street Underground Station. Indeed it might appear slightly surprising it does not connect with the Eastbound platform at Cannon Street. One can only speculate, but is probably a combination of cost and the very unsatisfactory situation of not having a corresponding Westbound platform connection – which really would be truly expensive and not really achieve that much. This again highlights how close the entrance to Cannon Street Underground Station (just out of sight around the corner) will be from the new entrance to Bank. On a more trivial detail, it is generally accepted that the closest two station entrances of two different stations on the underground are currently Queensway and Bayswater. 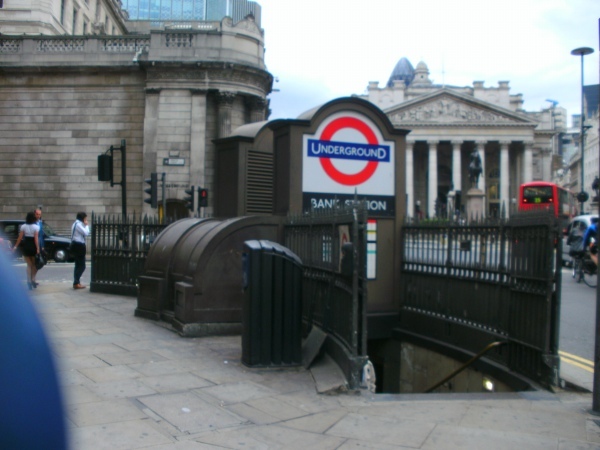 The future Walbrook entrance to Bank station may be even closer to the recently relocated entrance to Cannon Street underground station, and so Cannon Street and Bank may well become the two closest station entrances on the underground. As can be seen from all the above, the upgrade of Bank is thus highly important. It also needs to be more than just a simple facelift, and more than just the addition of a developer funded entrance. With the context and initial works clear, what form that Upgrade will take is what we will look at next.